This photo has all the elements of a good 48 hours along the shore of the Gulf of Mexico: fire, food, and a blue tarp. All hail the ubiquitous blue tarp! The post-hurricane source of keeping dry, getting by, making due. 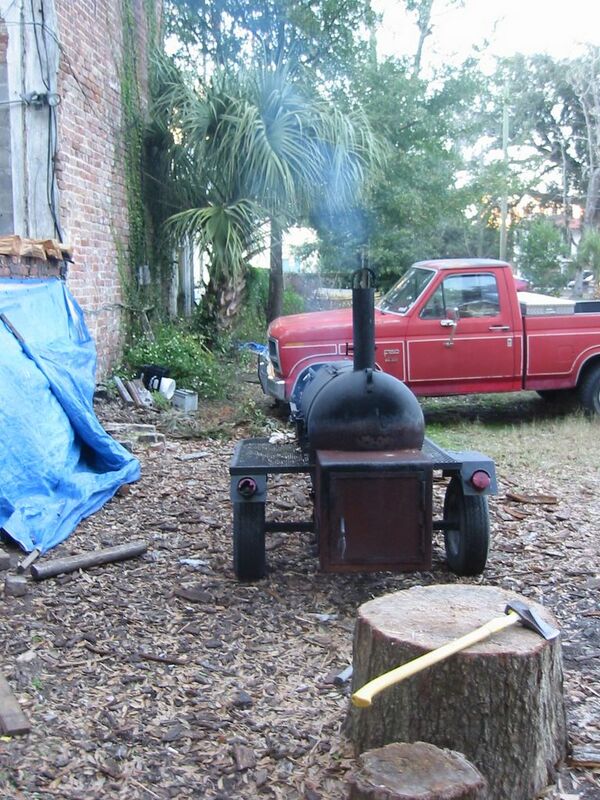 We were smoking 60 lbs of ribs, 30 fish steaks, zucchini, squash, onions, and anything not nailed down. The red ford truck pulls the smoker and carries 6 coolers in the truck bed; 4 coolers are for meat and the other 2 are for weather proof storage of cookware. If he finds a deal on meat or seafood he’ll dump the storage (in the passenger seat) and buy out as much as he can handle. Then off again to cook for the troops, the citizen soldier rebuilders of the Katrina & the Wave destruction tour ’05. It ain’t over, it’s just getting started.